Mountain biking in the Carinthian "Nockberge"
Mountain biking in the "Nockberge"
Carinthia is a popular cycling destination and the choice of tours in the Nockberge Mountains in particular will fulfil every mountain biker’s dream. Enjoy the unique experience of demanding freeride tours taking you up to the summits at more than 2,000 metres along natural tracks. Info & tips concerning the weekly program is provided by the staff of the Sportschule Nock Sport Huber. For dates and program calendar go to events. Our “Get together“ info service gives guests an overview of the array of activity and recreational options available here at Heidi Alm Falkert including climbing wall, fixed-rope route with flying fox, slackline, bouldering and fishing. Have a pleasant stay and wonderful mountain experiences! General: Alpine via ferrata following a natural ledge in a rock face without additional ladder rung. Approach: Along a well marked path to the signpost in the Sonntagstal valley then head northwards to the Falkertwänden Platten for approx. 30 min. From the access along the gully to the beginning of the dihedral A/B. Short traverse up to the end of the dihedral C/D and along a grassed ledge towards the pine A/B. Past the pine on a steep grassed ledge and a short rock step beneath an overhang to the rock register A/B. Up to a ledge A/B and continue up to a niche B/C. To the left traverse an exposed crossing, over ledges and steps to the beginning of a short gully-like ramp to the right B/C. Over a few rock steps to the left into the gorge-sided wall. Past rock slabs and ledges to the rope climb crossing the gorge and towards the end. Continue for 10 minutes along the walking path to the summit. Duration: approx. 2 hrs, climbing length approx. 300 m. Descent: along the marked path back to Lake Falkertsee – approx. 60 min. Use of the via ferrata at own risk! The East Tyrolean via ferrata builder and professional mountaineer Peter Ortner has achieved something great again with this via ferrata. In addition to the difficult "Falkensteig" there is now a lighter trail. The new via ferrata leads from Sonntagstal tonearly 400 meters long, almost up to the brand new summit cross. The approach is also on the well-marked way to Sonntagstal to signpost, then north to the "Falkertwalls" - about 30 min. 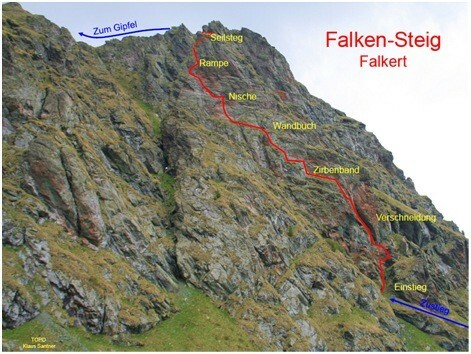 Entry is directly on the left, next to Falkensteig. The chosen line is excellent, not stingy withspectacular low views and exposed spots. Nevertheless, the climb can be classified in category B. Some treads were set and sometimes some steps were cut in the rock. Even a 20-meter-long rope bridge requires a lot of overcoming, but makes the heart of mountain enthusiastic via ferrata beat faster. The Heidi Alm Falkert is located directly at the core zone of the Biosphärenpark Nockberge. The Nockberge in Carinthia, form a very beautiful, idyllic hiking region with mostly simple trails. Therefore, the region is ideal for walking holidays with family with children. The gentle mountains take the little ones' fears off the mountain - so the joy of the movement, nature, animals and the pasture as a huge natural adventure playground in the foreground. Holidays on the Heidi Alm Falkert, that means pure relaxation for you and your family amidst an alpine landscape, as in the Heidi story: clear mountain lakes and streams, grazing cows on lush green pastures and a crystal-clear mountain air. Whether you simply lazy and relax, on a family hike the Falkert-Alm and explore the National Park Nockberge or on our exciting program of active participation is up to you. In any case, the healthy mountain air does the rest and guarantees a completely healthy and relaxing holiday!